In this book, Majeed Ali discusses the essence of Hajj (Pilgrimage). He also proves that Hazrat Ishmael (Ismail) (pbuh) was the son who was sacrificed. “And proclaim the Pilgrimage to ALL MEN” is the Quranic command of Allah unto the Holy Prophet Muhammad (peace and blessings of Allah be upon him). It is a perpetual call unto all Believers in God who accept the Patriarch Abraham as the father of organised Religion. Muhammad (peace and blessings of Allah be upon him) was that Prophet and descendant of Abraham, sent by God to invite all men into Abraham’s monotheistic Faith of Islam, that in truly organised form they may develop his religion; and in establishing a great world brotherhood would bring about the peace and happiness of Heaven on earth that as promised to those true followers of Abraham. The Pilgrimage is thus a wonderful exercise of human unity. Pilgrims of every race and nation, and from every walk of life gather upon the plains of Arabia and at the Holy Centres of Abraham in a grand show of mass unity of thought and purpose. Dressed only in two pieces of unsewn cotton garment and chanting together, “here we are in thy presence, O God” the Pilgrims must lose all feelings of per­sonal importance to the urge for collective spiritual power and purpose, together they must prostrate upon the earth that give them birth and succour that they may reflect upon their humble origins and their utter dependence upon Allah for life. In this collective frame of mind the Pilgrims think only of God as the Sover­eign over all and of themselves as equal co-sharers of the innumerous bounties of God. Here is born the spiritual power of Islam, of Abraham’s Religion that demands purposeful submission only to Allah and of sacrificing of the self for the benefit and welfare of others. Abraham was the first man to organise religion for the benefit of society and the shrine he built at Mecca in Arabia is a living testimony to his desire for all men to rally around this symbol of monotheistic faith that would inspire them into a single world-religious brotherhood. “God is one and mankind is a single community” is the Quranic dictum first voiced by the Great Patriarch. … and raise from among them a Messenger who shall recite to them of Thy Messages and who will teach them and purify them. Surely Thou are the Mighty, the Wise.” — The Holy Quran. It was in response to this prayer that through Ishmael the mighty Arab nation came into being and the Arabian wilderness began prospering with tremendous wealth. That through the Arabs peoples of all races who “yearned towards them” began accepting Abraham’s Religion of Islam and above all the great world-Messenger Muhammad (peace and blessings of Allah be upon him) came with the true Messages of the Lord to teach and purify the world in the name of Allah. The Pilgrimage to Abraham’s shrine in Mecca stands until today the symbol of Abraham’s monotheistic faith, a symbol of his desire for complete human unity, a symbol of the truth of Muhammad’s (peace and blessings of Allah be upon him) Divine appointment as the world Messenger (prayed for by Abraham) who has been the cornerstone in the build­ing and the establishment of Islam as God’s True Religion on Earth. 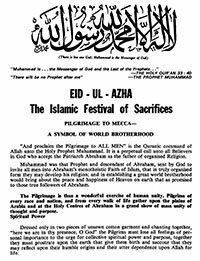 Eid-ul-Azha is the grand Islamic Festival of Sacrifices. It commemorates the historic sacrifice the Holy Patriarch had made of his son Ishmael on the barren wastes of Arabia. Many of us seem not to wonder about this kind of God-man relationship which had been experienced through the phenomenon of Divine Revelation. Mankind today does not seem to believe that such Divine Revelation has been a reality in the past and still is unto today—that God still speaks to those deserving of this special Divine Favour. We wonder why is it that God has been close to man in centuries past, that he spoke, to His creatures and showed many signs of Divine Grace, Glory and Grandeur to peoples of the past, and now he fails in his Graces to mankind. Where is God, is the question now. Why is he not around to help us in our modern day crises? Why is he not speaking to us and giving us hope as he did to our forefathers in ages past? Many of us answer these questions by saying—There is no God and there never was? Revelation is just man’s imagination and unreal. But there are others who believe there is a God and they have faith in his existence because of stories such as Abraham’s that have kept intriguing their minds with their rings of truth and their beautiful human appeal. But although they believe in God and that in the past He spoke to righteous men and Prophets such as Abraham, Jesus, Muhammad (peace and blessings of Allah be upon them), etc., they do not believe he still contacts mankind in this blessed way. The truth is, however, that God still speaks to man, and it is of utmost importance that we have faith in this greatest of Divine Favours. It is through hearing the spoken word of God, personally, that we can really believe in the true existence of God and come to obey His commandments that alone can save us from the destruction facing mankind today. But how do we receive speech from God? We have to listen keenly and faithfully with our spiritual ears for His Voice that ever keeps up His speech within our innermost selves. We can only succeed in hearing from the Lord when we purify our bodies of unclean thought and deeds and enter into prolonged and sincere meditation and prayer the way Abraham and other righteous human beings had done. Divine Revelation is not a joke or a thing of the past. In our own age the Founder of the Ahmadiyya Movement in Islam, Hazrat Mirza Ghulam Ahmad, had this most favourable experience. He proved it by showing certain signs and by way of prophecy. In these modern days of atheism, agnosticism and materialism, he proved the truth of Divine Revelation and we cannot ignore this wonderful phenomenon. It has meaning and relevance to our day to day existence. We need Revelation now to assist us in our present miserable existence and we must quest like the Prophets after such Divine Favours and Grace. Let us then emulate the life-pattern of Abraham and seek the Lord’s Guidance for the better and happier Life Divine. The Holy Bible has proven beyond a doubt that Ishmael was the first born and beloved son of Abraham and not an illegitimate child of an unworthy hand­maid as some erroneously imply. “And behold the word of the Lord came unto him (Abraham) saying . . . he that shall come forth of thine own bowels shall be thine heir”. (Gen. 15-4). “And the angel of the Lord said unto her (Hagar) Behold thou art with child and shalt bear a son and shalt call his name Ishmael, because the Lord hath heard thy affliction.” (Gen. 16:11). From the above Biblical quotations none can doubt that Ishmael was born by Divine design, being promised to Abraham and Hagar and blessed by God. Ishmael was Abraham’s first born and heir, the elder of his two sons who was offered to God for the historic Sacrifice. Many claim it was Isaac who was offered for sacrifice, but there is no truth in this. It is always the first born that is offered in God’s way for sacrifice of all sorts. “And the Lord spoke unto Moses saying, sanctify unto Me all the first born, whatsoever openeth the womb among the children of Israel, both of man and of beast is mine.” (Exodus 13:1). The Right of the Firstborn is His (Deut 21:15-17). These verses of the Bible give ample testimony to the fact that Abraham’s firstborn Ishmael has been so honoured by the great Patriarch and he was that son who was most assuredly involved in the famous Sacrifice and not Isaac. The theory of St. Paul that Ishmael was born after the flesh, thus falls to the ground and can be regarded as a violation of God’s Holy Words and as slander upon the sacred and pure characters of Abraham and Hagar (may Allah’s blessings be ever upon them). Ishmael was not born of the flesh. His birth was designed by God and made legal through His words in the Bible. “And Sarah said unto Abraham: Behold now the Lord Hath restrained me from (child) bearing. I pray thee go in unto my maid it may be I may obtain children by her. And Abraham hearkened to the voice of Sarah. And Sarah, Abraham’s wife, took Hagar and gave her to her husband Abraham to be his wife.” (Gen. 16:2-3).